The beautiful and affluent county of Kent has a special place in the annals of recent history in Britain. Situated on the south-eastern coast of the British mainland, the glorious region of Kent has often been on the front line of many conflicts which Britain found herself in. Particularity in the Battle of Britain, Kent was known as ‘Hellfire Corner,’ as it was here that the enemy did much damage. In areas such as Branstone and Maidstone, people can look and see some of the most historic places in Britain – a true sight to behold indeed. Situated close to London and within an easy commutable distance indeed, Kent has a thriving economy – with lots of investment in local and regional projects. Being close to London, it makes for a glorious travel destination – great for people needing to escape the ‘hustle and bustle’ of the capital for a short while. Our much loved hog and spit roast catered events often cater for such weekend travellers. However, in areas such as Crayford and Halstead, our services serve the local community unflinchingly. With exceptional levels of quality in terms of the ingredients available, the people and folk of the famous Home County of Kent help to serve companies such as ourselves by providing such wonderful produce. By standing by the ancient method of slow roasting over flames, we love roasting whole meats to their glistening level of perfection – great food every time. Our clients in areas such as Woodchurch have really enjoyed our catering at their weddings – where our theatrical flame roasting combines with restaurant smashing tastes and culinary experiences. On top of this, our corporate events have also proved to be a real hit. Often overlooked in favour of bordering counties Kent is the homeliest of the home counties. You might often speed through it on your way to the city or to the coast, but if you live there, you’ll know there’s a lot more to the county than several miles of motorway. We have provided just about every service possible relating to hog roast catering to people in every corner of Kent, from the understated terraces to the quaint, historic streets and anywhere else you care to mention. Whether it’s hog roast party catering or hog roast machine hire providing the means for others to do it themselves, we’ve done it. As Kent is home to a number of small towns surrounded by tranquil countryside, there are many places which act as unbeatable venues for weddings. While the venue itself is an important part of the whole day (but not as important about whether the happy couple agree to tie the knot), the food is also important, as, if it’s not up to scratch, it can help to sour what would otherwise be a great day. Luckily, a large part of what we do is catering for weddings all over the county. The basis of our popularity in this particular field of catering is our bespoke wedding menu’s. We know that you want everything to be perfect on the big day, and, to try and make sure that you have the feast to go with the occasion, each option on the menu provides a luxurious feast which goes beyond just satisfying hunger. Each option on the hog roast wedding menu fits the occasion perfectly, from our most basic option to the more extravagant options. You get a spit-roasted pig (or two, depending on which option you choose) or other type of spit-roasted meat, your choice of potato dish, salad, sauce, and, at the higher end of the scale, your choice of starters and dessert. With each option, we provide cream to go with the wedding cake (which you bring yourselves), as well as all the crockery. With every hog roast wedding catering job we do, we come to the venue on time. We bring all the right ingredients, prepare, cook and serve everything with the expertise that we’ve developed over our many years in the hog roast catering trade. We even clean everything up afterwards, so there’s no need to do the dishes in your expensive wedding dress. As well as catering for weddings, we also do top-quality hog roast catering for parties, Christmas dinners and corporate events, and we have specific menus available for each type of event. Whatever event you’re hosting or attending, ordering something from us is the best thing you can do. In addition to catering, we also sell and hire out hog roasting machines exactly like the one we use for all our catering jobs. Our machines are state-of-the-art, and have never let us down when we’ve called upon them for any job, no matter how big or complex. 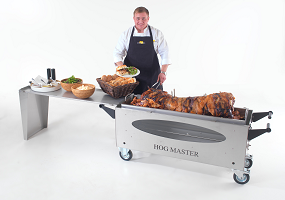 Hiring a hog roasting machine is perfect for one off use for a large outdoor event. If you’re organising a village fete or holding a large family barbecue, and your barbecue grill isn’t big enough to cope with demand, then using one of our machines is a great way to put an end to all that. You can cook a whole pig on it, which is enough to easily feed over twenty people, and cooking it is a whole lot easier, as you don’t have to check whether it’s done every couple of minutes or turn the meat over. Buying a hog roasting machine permanently is an ideal solution if you’re in the hospitality trade, and you need something different in your kitchen to try and help to get new customers to keep your business ticking over. They save space for cooking other stuff like vegetables, which would otherwise be taken up in your conventional oven by a joint of meat, and you can cook any kind of meat or poultry on there, from chicken and turkey to beef or lamb. It’s also easier to serve the meat straight from the machine than it is from a normal oven. Whatever your hog roasting needs, we’ve got the resources and know how to meet them. If you have any queries about our menus or the machines, then feel free to contact us either through the website or by phone. We’ll be more than happy to help.